(Rumour) By year end Google to launch Motorola Nexus ? 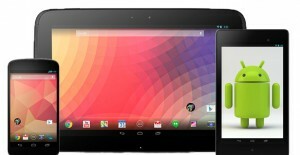 Home » News Android » (Rumour) By year end Google to launch Motorola Nexus ? (Rumour) By year end Google to launch Motorola Nexus ? A new Nexus device is on the horizon. As in the past, the end of the year is the usual time for Google to announce either Android updates or a Nexus device launch and we’re fast approaching the limit. Speculation has been abuzz about who will release the device and whether it will fall into the laps of LG, ASUS, or someone else. However, some insider information has revealed that Motorola may be the next contender for the Nexus name tag. 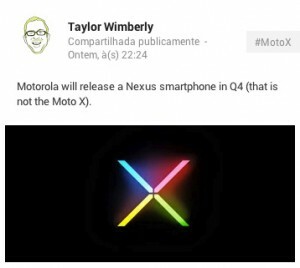 Taylor Wimberly, someone who has already provided some pretty accurate information in regards to the Moto X, has released a post on his Google+ page that Motorola will be the next contender for the Nexus line. What more, the new device will not be based on the Moto X but will be something new all together. While this is only one source and we’ve already erred on the side of caution when it comes to this kind of stuff, it does seem plausible that Motorola would be a contender for a Nexus device. While being under the reigns of Google, wouldn’t it be awesome to see something come from the two of them that would have the same kind of cutting edge technology we’ve expected from previous Nexus reveals? As more information arises, we’ll stay on it. For now, let’s just safely realize that Motorola may or may not be a contender. However, I’d be pleased as punch if they did end up getting to do it.